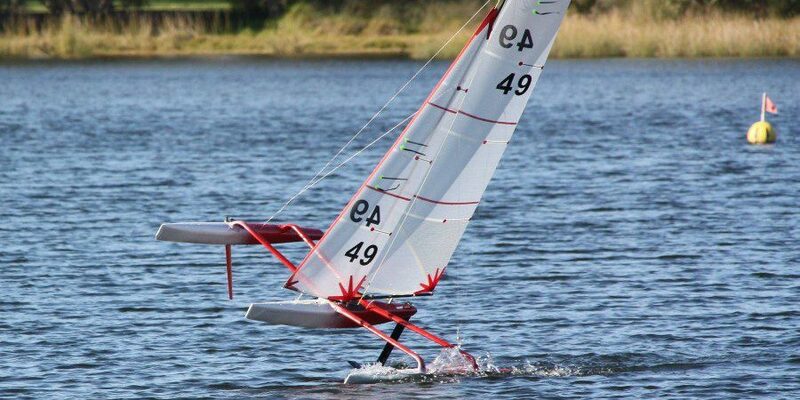 In 2016, X-Yachts launched the new X range which included the X4³ and the X6⁵. 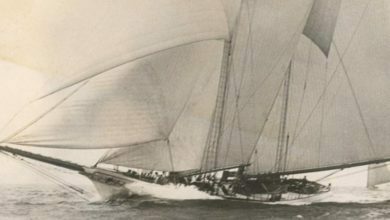 This range was well received, with more than 75 yachts sold in the first two years. In January 2018, the X49 was presented for the first time to the press at the world’s largest boat show, Boot Düsseldorf and in the same occasion the yard revealed the first design layouts of the X-Yachts X46. “This boat will be the ideal family cruiser, that can also get a bit racy at the weekend”, said Niels Jeppesen, Design Director. “It’s fast, stylish and safe. 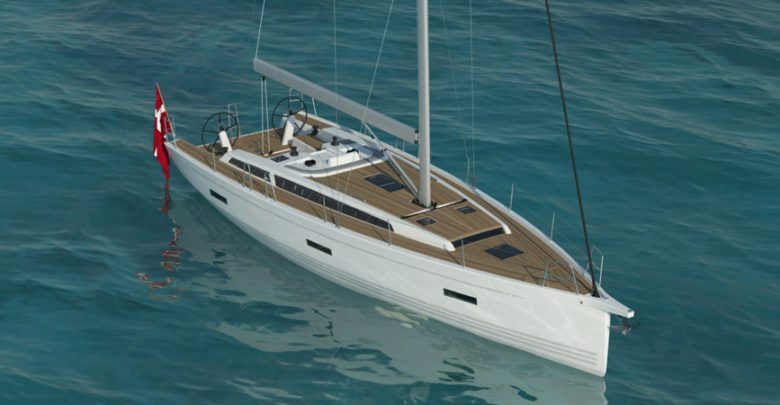 The sailing experience for an X-Yacht is meant to be outstanding, and we dare to promise that the X46 will come standard with those build and design features, which for almost four decades have set X Yachts apart”. 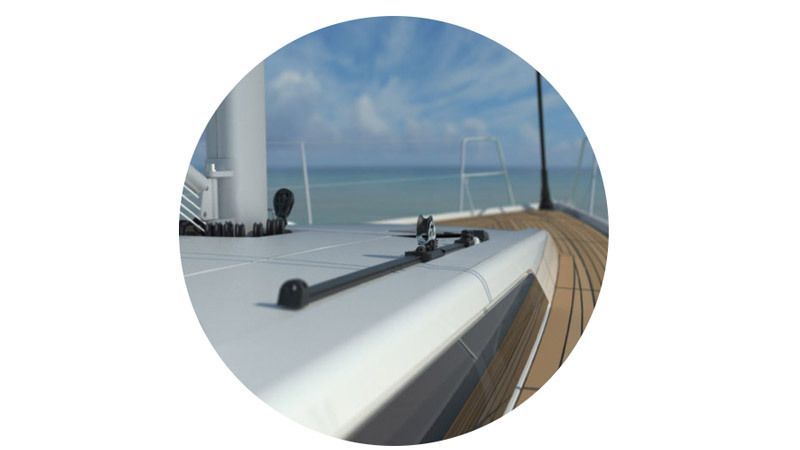 The hull design of the X4⁶ follows the latest design philosophy to maximise sailing performance. 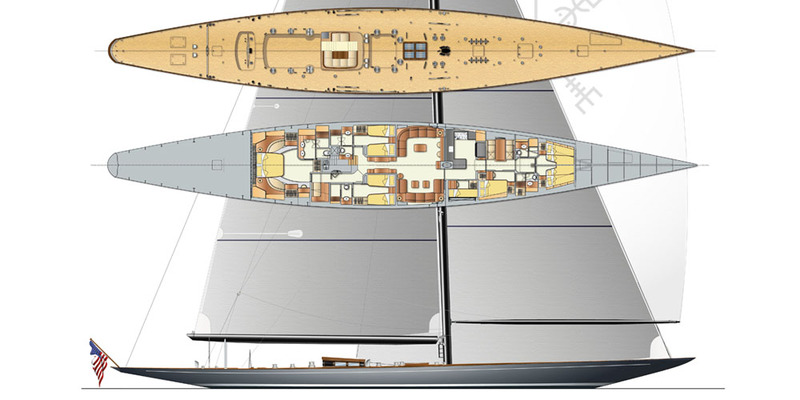 The deck layout takes a combination of the features from both her siblings; a self-taking jib is standard, with sheet handled by one of the halyard winches, and a mainsheet track is recessed into the cockpit sole with an 8:1 purchase traveller control system. Each of the twin wheels is connected to its own quadrant with a completely independent wire system. Teak comes standard in the cockpit and is optional on side decks and on the coach roof top as well as on the electrical operated bathing platform. 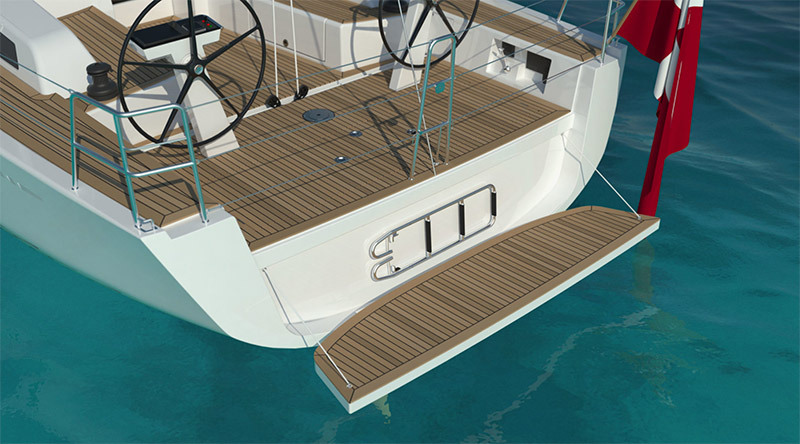 The yacht is delivered with a modern common rail diesel engine, delivered with a standard 2 blade Flexofold folding propeller. 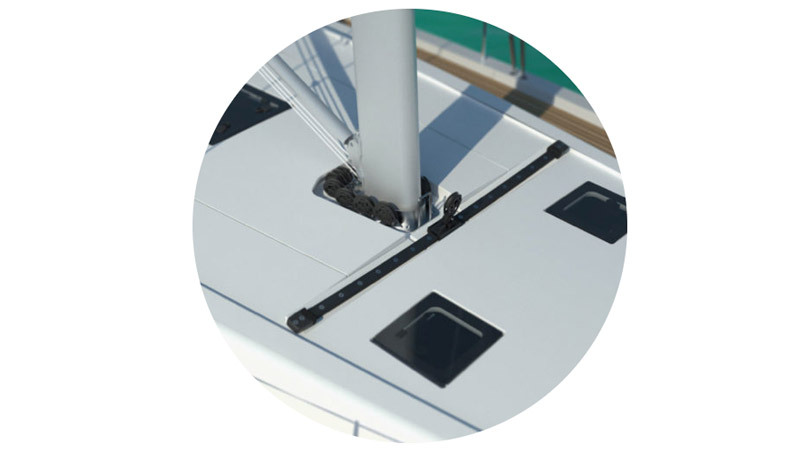 Recessed track for selftacking jib – Designed for sailing in comfort and at ease, with a deck recessed track for a selftacking jib. The sheet for the 97% jib is lead back to a halyard winch. Optional longitudinal Genoa tracks – 2 optional longitudinal Genoa tracks on top of the coachroof allow the use of a 106% overlapping genoa, maximising the X4⁶’s light wind performance. 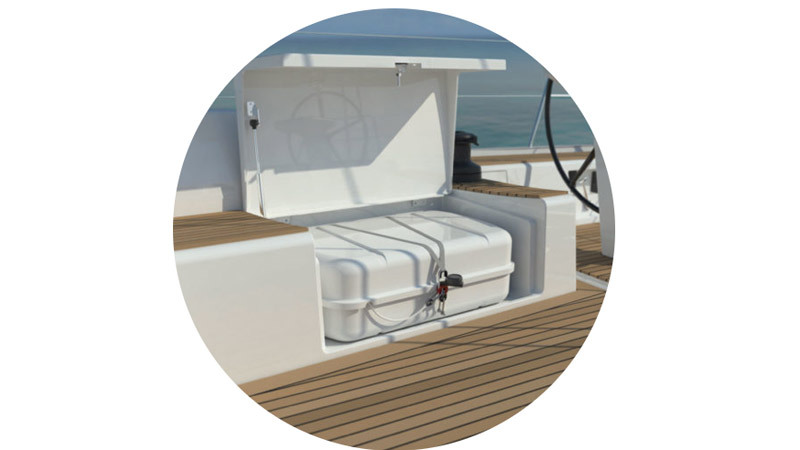 Dedicated Liferaft Locker – The starboard-side cockpit bench houses a dedicated locker which can accommodate a 6 or 8 person liferaft. The interior layout has two almost identical aft cabins, with the difference that the port aft cabin is wider, enabling this cabin to be offered in a split version. The owner’s cabin accommodates a king-sized double berth whereas the galley is largely L-shaped with numerous practical equipment. Each aft cabin has an open-able portlight in the cockpit and additionally an outboard facing opening in the coaming windows. Last but not least, the X46 has two bathrooms.